Set in a room full of Persian tapestry carpets and rugs made of the finest high-quality fabrics and designs, Paul Smith’s A/W 2014 British Collection is presented on mannequins and displays throughout the showroom. A small turntable record player plays tunes by The Doors, Bob Dylan, and the Patti Smith Group. Paul Smith chats comfortably among the people in attendance who enjoy a tea and a mini-pastry while browsing through the new collection. Highly respected in the fashion industry and best known for his creative spirit, Paul Smith’s AW 14 British Collection focuses on design detailed fabrics woven into the cloth using innovative techniques before being cut into a piece of clothing. To achieve this seasons innovative cloth construction, Paul Smith has teamed up with Yorkshire Mill, Joseph H. Clissord. Every cloth is passed through their looms and through the fingertips of a textile artisan. 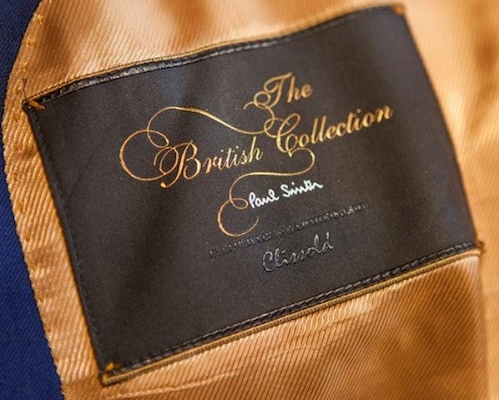 The result is a beautiful high caliber fabric weaved to perfection, a characteristic inherent in all of Paul Smiths special British Collection line. Pieces include jackets and blazers with patterns such as enlarged Prince of Wales check in monochrome, graduated white stripes on navy, and floral prints styled over denim shirts. Accessories include gloves and footwear in various styles and textures in a brown and orange spicy Autumn palette. Middle Eastern inspiration infused with British heritage can be seen in the layering of the pieces such as the cut and length of the jackets, as well as the styling completed by scarves.